A Dream (synonymous with: Ambition and Aspiration) is often regarded as the major part of an ultimate start or a push to a fulfilling finish; the proposed towards a purpose. Now, what happens when it’s all gone? What happens WHEN YOUR DREAM IS GONE? 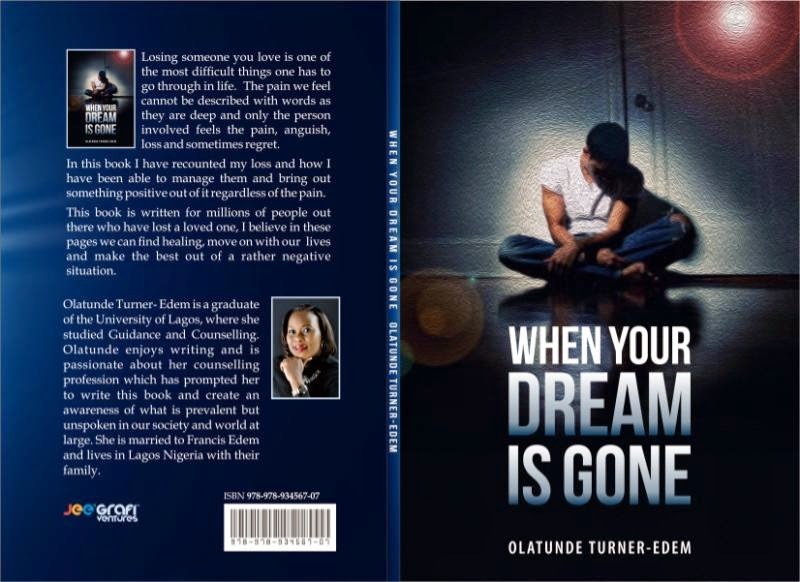 In this powerful book, the author recounts her painful past as a child faced with the loss of a wonderful father, the betrayal of a university entrance examination after struggling to make it through both GCE and Jamb at a sitting, all at the struggle of fulfilling a father’s dream, the loss of a sister to asthma a few hours into her wedding. All these grievous occurrences with lasting remedy to life’s awful, destructive situations. Usually, while in pain and shock of losing a loved one, we tend to go angry and say horrible things especially to God and also to man. If you know someone who is facing depression due to an irreparable loss or anyone who has almost cursed God and blamed men for their loss, get this book to them. It’s like serving hope and purpose to them to rise up, remain firm and most of all, dream again. While i was reading this book, I realized how much I not only needed [and loved] my dad but how much more I’ll hurt if I lose him. I’m often reminded that I not only have to fulfill his dreams [for me] Also, i have to take care of him while he’s still alive. It reminds me of how much I can’t afford to fail him in my endeavors. For me, this book is an eye opener. You should read it.